The offensive against Parthia has begun!!!! On the evening of the 26th of July, General Scipius has launched a suprise attack against Phraates - Supreme Commander of the Parthian forces - near the Parthian city of Nisibis and has made a large territorial gain. His, and General Rubinus' Roman troops are now closer to the city then ever before ! stratego, did you draw that? I think national geographic has an opening for a cartographer they'd like you to fill! I think AB does the maps. Either way, they are always good! No kidding. Great maps! Whoever does them thanks! Stratego does the maps, I post them! It's good team work anyway! 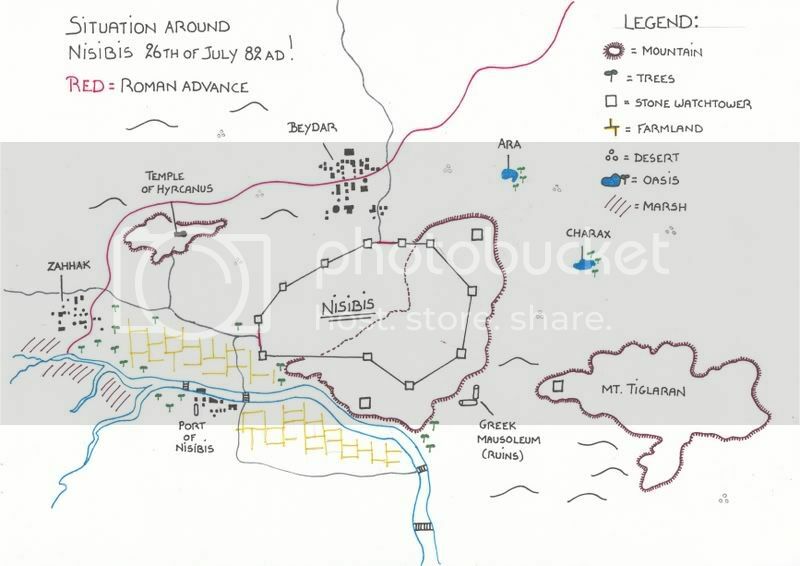 So, after the suprise night attack by Scipius' cavalry on the 26th, the Roman army made alot of territorial gain and although the main Parthian army has not been reached, the legions stand now in striking distance from the city of Nisibis (the RED LINE on the map is the furthest Roman position after the night offensive). As you can see, they have reached the suburb town of BEYDAR in the north and the farmer village of ZAHHAK to the west. Now as turn 7B has started, general Scipius and generals Rubinus will have to decide how the Roman forces will go on from there in order to defeat the Parthian army under Phraates. The commanders will be allowed to position the army behind the RED LINE under command of various officers, but may also position troops OUT OF THE MAP in the immediate surrounding area. The various commanding officers will be played by the various SPQR players -if they are interested of course . List of Roman Officers !!! Alright, here's the list of officers the players of SPQR can choose to play in the (final?) offensive in Parthia. Obviously, Admiral will play general Scipius and Achtung Baby will play general Rubinus and therefore cannot choose an officer !!! What is the quality of the troops under his command? Have they been well trained and disciplined or will they quickly flee from the battlefield when confronted by superior Parthian forces? What is the tactical insight of the commander? Does he easily oversee the dangers approaching him or will he fall for the oldest Parthian trick in the book? Will he be able to give orders quickly if his men are threatend to be attacked from the flank? Does he possess this warrior "gut feeling" for imminent danger? Is this officer loved by his troopers? Will his presence amidst the rankers during a struggle create that extra effect to gain victory? Will his men lose heart easily if their officer falls among them or will it instead give that extra adrenaline to overcome their ennemies in a desperate last stand? Is this officer lucky? Will he be quickly felled by an arrow? Will he easily fall amidst his men or can he be wounded 10 times and still survive the ordeal? PS: By the way...6 is the highest score to get on the characteristics! Last edited by Stratego; 30 Jan 09, 17:34. As the one to pick first, I will go with Arses the Scythian.